Waste Heat Recovery systems integrating the best available Organic Rankine Cycle (ORC) electricity generators into industrial kilns, furnaces, incinerators and biogas sectors. At the heart of a Heatcatcher System is an Organic Rankine Cycle (ORC) generator capable of converting waste heat temperatures as low as 80°C into carbon free electricity. We have extensive experience of integrating best available proven Heat Recovery technologies into energy intensive industries operating kilns, furnaces, incineartors and biogas engines. Successful projects require a turnkey system designed to operate with minimal operational cost and maximum financial return. Our turnkey service starts with an initial proposal, to feasibility study, to full design specification, project management, installation, commissioning and the life time maintenance of the system. We undertake a heat recovery survey of your site, collecting process performance data for input into our unique Waste Heat to Power Forecasting model. From the data the customers financial and environmental benefits are determined against the investment cost of the Heatcatcher system. Our technical backgrounds in the fields of process, chemical, electrical, energy management, computational fluid dynamics, and ventilation engineering, provide the wide range of competences needed to ensure a successful Waste Heat to Power project. Whether your source of waste heat is exhaust gas, hot water or steam at the heart of a Heatcatcher system we install the best available Organic Rankine Cycle working fluid/expander/generator technology with a proven track record for performance and reliability. With over 30 different manufacturers producing ORC generators across Europe and North America all with differing technology ranges and costs per kW of power generation, Heatcatcher is independent and best placed to select and integrate the best available technology to match your waste heat source. The Heatcatcher system can be bespoke for larger electrical generators over 500 kWe or modular for smaller systems from 10 kWe to 500 kWe electrical generating output. The modular system offers flexibility, lower costs per kW and an asset that can be moved to another waste heat source location if required. The Heatcatcher Waste Heat Recovery WHR system integrate the Best Available Organic Rankine Cycle (ORC) Technology. ORC technology is based on several well-known and tested technologies. The majority of electricity produced worldwide is generated using the Rankine Cycle, typically a (water) steam generator. The 'Organic' term refers to the fluid used in the cycle which is typically an organic-based working fluid which evaporate at lower temperatures than water. The advantage of using working fluids with lower evaporation temperatures is that heat can be recovered and passed through the expander of an ORC at much lower temperatures, current technology available can recover hot water temperatures as low as 80°C to generate electricity. The operation of the ORC plant is fully automated during process operation as well as in shut down procedures without any need of supervision personnel. In case of faulty conditions, the ORC plant will be switched off automatically and separated from the thermal oil or hot water circuit and from the electrical grid. 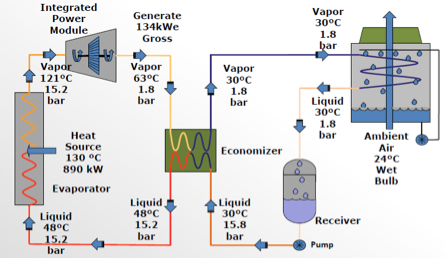 The diagram shows the example of an ORC cycle using R245 Fa working fluid which starts to evaporate from liquid form at 15 °C and when heated to a temperature of 121 °C it is in a gaseous state and passed through the high speed turbine to generate electricity from the Integrated Power Module. Sir John has managed and owned a number of successful companies within the engineering and construction industry since the 1970's and has an engineering background dating back to 1900, being the great grandchild of Sir John Aird, the notable English civil engineering contractor of the late 19th century. Sir John started his career as a hydroelectric engineer working on large dams in Zimbabwe and has since worked with companies such as John Laing and Sons, Davies Dowson Ltd, Head and Southon Ltd, and most recently, Matcon Ltd. Sir John was awarded a Bachelor's Degree in Engineering from The University of Oxford and a Master's Degree in Business Administration from Harvard University. He is a qualified Civil Engineer and has specialist knowledge in: The Management of Project based companies requiring the cost control of long term complex Engineering projects. Darren is an experienced entrepreneurial CEO with over 20 years in managing the sale and provision of mechanical/electrical/refrigeration equipment and services for commercial buildings and industrial processes. Darren gained a Masters Degree in Business Administration in 2000 from Kingston University, whilst in the post as Managing Director of Kiloheat Ltd a UK manufacturing subsidiary of the US based MASCO Corporation. As a qualified Eng Tech Mechanical Engineer he has over 20 years' experience in mechanical/electrical/refrigeration and energy management engineering. Adil graduated from University of Brighton gaining his Masters Degree in Aeronautical Engineering. He was involved in major research team project with Heatcatcher & University of Brighton entitled 'Improve the efficiency & life time cost of an industrial waste heat to power system'. Adil started his career with Heatcatcher as an internship in 2012, gaining knowledge in research, design, modelling and commissioning of Waste Heat Recovery systems. His skills revolve around project management, process engineering & fluid dynamics for Waste Heat Recovery projects. He is also an associate member of Institution of Mechanical Engineers and a member of UK Heat Transfer Society. Peter graduated with an MEng distinction in Electrical Engineering from the University of Brighton, and was involved with the optimisation of the 'UKs first waste heat to power system using ORC technology' as his Master's Degree project. He is a Member of Institute of Engineering and Technology. He brings 8 years working experience from the Telecoms industry.